Fabtech is a pioneer in making Cleanrooms affordable to all, without compromising on the quality. We specialize in designing, manufacturing and supplying modular panels to construct walls and walkable and non-walkable ceilings. With over 2 decades of experience around the world and the ability to set up facilities to handle highly potent products like hormones, cytotoxics and biotech molecules, Fabtech has made a mark in manufacture and setup of facilities with global standards. Most of our facilities have been inspected and approved by global regulatory authorities like the US FDA, MHRA and TGA. Roll forming machine: It is used for decoupling of PPGI/PCGI coil having the auto program setting. It can also be used to produce tray for the panel with different widths. The maximum & minimum width which can be produced is 1220 mm & 385 mm respectively. Amada brake press: This is a NC controlled semi auto machine used for bending of the component. We can bend sheets of various thickness by changing the die & punch. Amada punch press: This is a fully automatic machine having 30 turret punch station, programs can be loaded through SD card by using AP-100 Software, and we can punch 0.5 mm to 6 mm sheet on it. Puf machine: This is a high pressure machine used to fill mixture of Isocynate and Polyol in a specified ratio. It is used to fill insulation into hollow panel by inserting mixture of Isocyante and Polyol. Hydraulic press is used to press panel as per curing time of panels. Machine has an output of 0.8kg/sec. Powder coating line: We have fully automatic programmed 2 guns on both sides & conveyor with gas fired oven to coat different shades of powder. 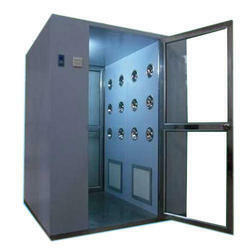 It consists of cleaning zone, preheating zone, powder coating booth and oven. We have a conveyor system for the movement of an object. Pre Insulated panel machine: It is a continuous panel making machine. We can use Puf slab, Rockwool, Thermo coal as insulation in it. A two component bonding adhesive arrangement is provided in this machine; the line speed of which can be controlled. Fitment between two panels is done by Tongue & Groove design of panel. In-built heating system is provided in it. Dust plays havoc with clean conditions and results in expensive maintenance. Preventing the infiltration of dust at the point of entry of raw material with Fabtech’s De-dusting Tunnels results in substantial cost savings. Specialised manufacturing in industries like pharma, biotech, food and beverages, even semiconductors, defence and aerospace mandate sterile/clean environments where foreign particulate matters have a negative impact on product quality and yield. A significant challenge that needs to be addressed is contaminant entry from the outside through raw material containers, canisters, sacks and bags brought into the facility. Fabtech’s De-Dusting Tunnels are used to remove the loose particles and dust that accumulate on raw material containers even before they are brought into the warehouse prior to sampling. This offers a significant reduction in dust levels, ensuring product quality and improved yield. These tunnels are a single pass fully automated system with sliding doors at entrance and exit of the system. Containers are moved through an endless conveyor and through combinations of rotary moving brush in X and Y axis which scrub and detach non-viable particles from the container. Containers are subjected to high-velocity air, and loose particles are collected in a tray while airborne particles are retained in a series of filters. Fabtech pioneered De-dusting Tunnels and ever since we have upgraded and innovated the product through continuous customer feedback. We continually add new features to address evolving requirements. Our De-dusting system is increasingly becoming a part of the standard project design layout. Fabtech’s de-dusting system is GMP compliant, reliable, automated, mechanised system, delivers consistent performance and is easy to maintain. It offers more consistent performance over human manual cleaning, is predictable, reduces dependence on manpower and saves costs. Add-on features like synchronisation with continuous sampling system make it an online integrated system with proper data storage and tracking. Looking for Cleanroom Partitions And HVAC ?